The 2007 Holiday Blend is here and it is absolutely delicious. Well done, Batdorf and Bronson! The 2007 blend is rich with a heavy bodied sweetness. Many of our cuppers were able to detect notes of fruits and chocolate in the coffee. On Wednesday night’s Holiday Blend cupping we paired it with many of the season’s delights – holiday decorations, sweet breads (panetone), chocolates, truffles, dried fruits, candied nuts, cannoli, sfogliatelle, brie with fig spread and of course the incredible Chateau de St Aubin Armagnac. 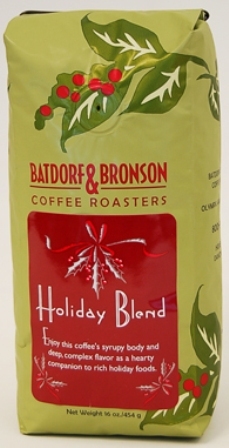 True to Batdorf and Bronson’s goal, the 2007 Holiday Blend highlighted the smells, sights and tastes of the Holiday Season. The coffee is available at Tazza D’Oro by whole bean or ground and 1 or 1/2 lb quantities.